Wed, Sep 5, 2018, 08:59 am SL Time, ColomboPage News Desk, Sri Lanka. Sept 05, Colombo: Sri Lanka's biggest annual business summit, the National Conference of Chartered Accountants organized by the Institute of Chartered Accountants of Sri Lanka (CA Sri Lanka), is set to take the center stage in inspiring Chartered Accountants to take that all important leap which will help them evolve and thrive despite the increasing business world complexities. 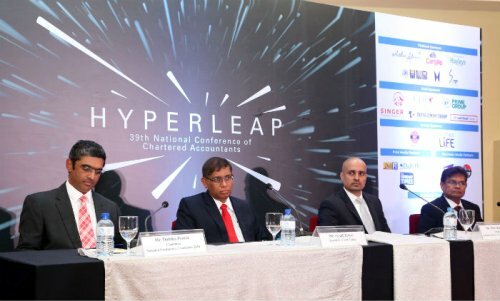 The 39th National Conference which will revolve around the theme 'Hyperleap' will help Chartered Accountants understand the need to embrace challenges, whilst ensuring that they take a bold leap without being shackled by technological, demographic and economic changes. The conference which will be held from 08th to 10th October 2018 at the BMICH, will focus upon the increasing technological disruption, future HR challenges and changes to the global economy, whilst emphasizing the important role accountants have played in the past in propelling businesses to the top and the important role they can continue to play if they continue to be relevant. Speaking at a press conference held in Colombo to unveil this year's conference theme, President of CA Sri Lanka Mr. Jagath Perera emphasized that the technological revolution has brought in monumental changes to the professional community including the accounting profession. "The challenges and complexities we face as a profession, has renewed the need for us as professionals to adapt to new trends, technologies and methodologies, if we are to remain relevant as a group of specialized professionals. This is why CA Sri Lanka has been spearheading various initiatives to ensure our members are not just qualified, but they are also given a platform to evolve and thrive in today's context," he said. Last year's national conference attracted over 1700 delegates including business leaders, c-suite executives and top professionals. This year too as in the past, the institute will offer the conference via webcast for the benefit of Chartered Accountants who are overseas. The three day conference, which also comprises two days of technical sessions will bring together a cross section of local and foreign speakers and panelists who are well versed in taking bold initiatives and thriving despite the challenges they have faced in their professional lives. Addressing the media, Chairman of the National Conference Committee Mr. Dulitha Perera emphasized that Chartered Accountants have always played a pivotal role in the private and public sector in propelling economic development. "They are equipped to contribute immensely in boardrooms with the ability to steer strategic decision making. This is why our Chartered Accountants have a far greater responsibility lying on their shoulders. We have to be in the forefront to ensure that our members change with time and embrace the challenges to ensure they continue to be relevant and will continuously add value to their company and their country," he said. Speaking further, the National Conference Committee Chair also noted that with challenges and complexities being part and parcel of the business world, Chartered Accountants must progress to become visionary thinkers by having the foresight to see what the future holds and therefore adapt and evolve to take on new challenges boldly by acquiring the necessary skills and knowledge. "The National Conference is therefore the perfect platform to enhance mind development, because it focuses on very pertinent areas relevant to Chartered Accountants which in turn help them acquire new knowledge, all while stimulating their thoughts and line of thinking," Mr. Dulitha Perera added. Meanwhile, Chairman of the National Conference Technical Committee Mr. Moiz Rehmanjee explaining the rationale behind this year's theme emphasized that the committee decided to choose 'Hyperleap' because it has become important to ensure that the members of the profession are not subdued from challenges they face, but instead are enabled to spin them into opportunities. "As professionals, we must boldly go forward, and not be shackled by the ever changing technologies and demographics. We must all embrace challenges and spin them into opportunities and be ready to take that leap, boldly," he said. Mr. Rehmanjee also said that due to the disruptions of traditional business models and the advent of digitization, among other changes spanning HR and the economy, Chartered Accountants are well placed in organizations to equip themselves with skills and experience to move ahead into the future. "The skills we possess helps us to learn and adapt quickly, seizing opportunities amidst trials," he added.